Armament: Sept. 7, 1863: 5 IX-inch, 1 100-pdr. Parrott rifle, 1 heavy 12-pdr. Namesake: Joshua Barney was born 6 July 1759 in Baltimore, Md. He served with distinction in Hornet and Wasp during the Revolutionary War and at the outbreak of the War of 1812 reentered the Navy as a captain, and commanded a fleet of gunboats defending Chesapeake Bay. At the Battle of Bladensburg, Barney and his sailors, acting as artillerymen, made a heroic defense of the National Capitol. 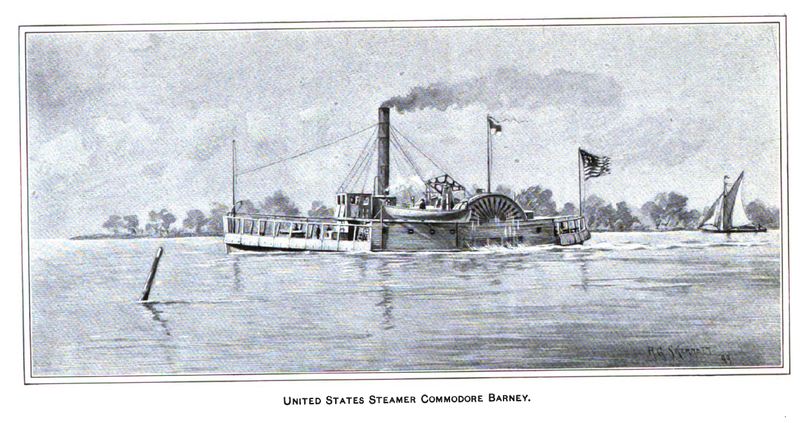 Commodore Barney died 1 December 1818 at Pittsburgh, Pa.
Commodore Barney, an armed side wheel ferry, was built in 1859 at New York as the ferry boat Ethan Allen; purchased by the Navy 2 October 1861; and commissioned later in the month. On 13 and 14 April 1864, she joined in the James-Nansemond Rivers expedition. After spending the period from 22 April to 27 June 1864 in the North Carolina sounds she returned to cruise the James and Appomattox Rivers until ordered to Washington Navy Yard 5 May 1865. She was sold there 20 July 1865.